On successive Fridays, a large number of Palestinians have gathered close to the fence that separates the Gaza Strip from Israel. Map showing Israeli communities near the Gaza border and the location of Palestinian protest encampments. Originally intended as a peaceful protest, the event has been hijacked by Hamas, who have offered financial incentives to those injured or killed in the protest and incited violence against the Israeli soldiers stationed on the border. 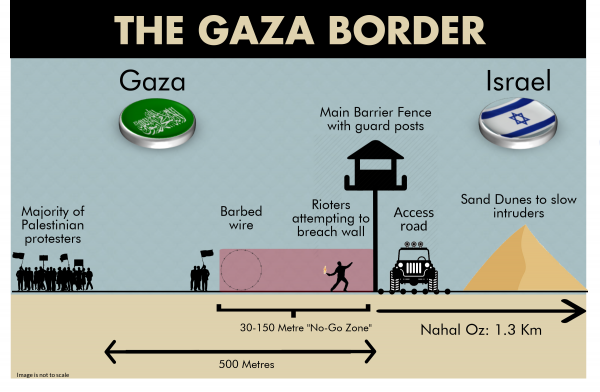 Hamas operatives have used the protest as cover for planting explosives on the border fence, throwing firebombs and pipe bombs at IDF soldiers and attempting to breach Israel’s border. With further violence expected on Friday 13 April, the BICOM research team has produced a briefing outlining what has happened so far, Hamas’s role in the escalation, the IDF protocols and casualties caused by Israel’s response, and what might happen next. Download the full briefing in the link below. BICOM strategic assessment – Hezbollah in 2016: damaged goods or dangerous war machine?